Regardless of our professions, each of us is inherently a creator. We start early, creating unconquerable cities with building blocks and spinning entire lives centered around dolls and teddy bears. Creation is at the heart of humanity. Even when we think of our meals, we are mentally creating appetizing combinations of cuisines. The art of creating has advanced by leaps and bounds as technology has advanced us as a species. Part of the problem with humanity creating is the fear that we might be too good at it. That we might create something we can’t control. That our creation takes on a life of its own. We’ve seen this in literature for hundreds of years with Frankenstein as the long-lasting example. More recently we can point to 2001, Terminator, Blade Runner, The Matrix and dozens of other books and movies that have shown us what humanity has dared to create has ultimately come back to bite us in the end. 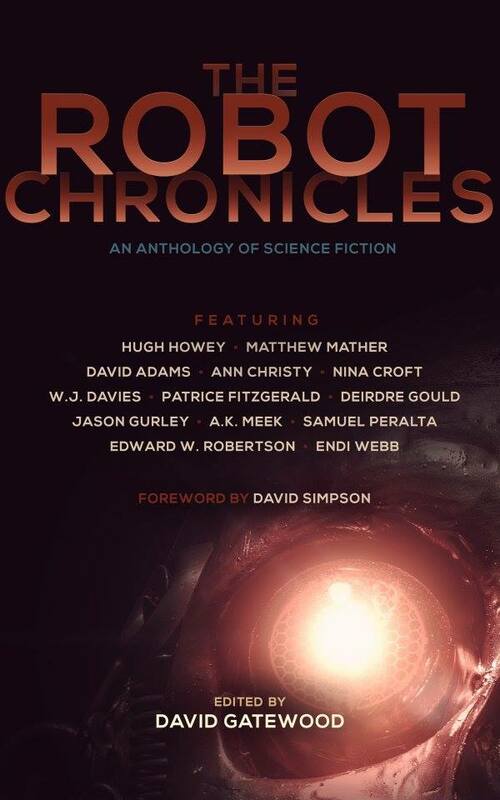 And so, we get the latest David Gatewood anthology of short stories, The Robot Chronicles. Gatewood has again assembled a ridiculous amount of literary talent for 13 outstanding stories all involving robots in one form or another. Headlining the collection is Hugh Howey (WOOL) and Matthew Mather (Cyber Storm) and neither one disappoint. Howey’s story, Glitch, was published not long ago on its own and reminded me a lot of the movie Real Steel with fighting robots. What one person perceives as a glitch may be more than that, especially to the robot. I’m not going to go through each of the stories, but each was fantastic and memorable in their own unique ways. I was a huge fan of Isaac Asimov as an adolescent and found each of his Robot stories to be their own moral tales in many ways. These stories are no different, offering viewpoints on what life actually means and how we treat it. Just because we are the creators, does that mean it lessens the life we hold in our hands? A perfect story to go along with this idea is W.J. Davies’ Empathy for Andrew, where we see a situation similar to what Asimov’s Dr. Susan Calvin might have been involved in. Testing new and breakthrough robotics techniques, scientists push the limits of where the line between robots and humans lie. Andrew is the titular robot who is put through a battery of tests to test his empathy chip and Davies does a remarkable job in telling this story. Another story I remember from Asimov’s Robot collection was that of Satisfaction Guaranteed, another Susan Calvin story where she was noticeably absent until the end of the tale. In this story, a woman has a human-like robot live with her and eventually she comes to think of him as more than a robot. You see this theme played out in two separate stories – Ann Christy’s PePr, Inc. and Patrice Fitzgerald’s I Dream of PIA. Both handle this theme in remarkable different (and in Fitzgerald’s case, bawdy and funny) ways. There are also hints at Asimov’s child/buddy stories like A Boy’s Best Friend or Robbie where a child has a robot for a companion and friend. Edward W. Robertson takes the story further. His protagonist, Alex, received Bill as a companion when he is young, but over the years they become more than that – business partners and musicians. Just like a number of famous musicians, things happen and the band doesn’t always survive, but in Baby Your Body’s My Bass, Robertson ends the story on a positive note, in a very Golden-age way. But the stories that really resonate and stick with me tend to be those that have a larger scope in mind – like A.K. Meek’s The Invariable Man where the fate of the world may be at stake or Deirdre Gould’s post-apocalyptic story System Failure. One of the best things about this collection of stories is that it got me to get out my collection of Asimov robot stories and re-read and re-discover them in the light of this remarkable modern anthology. Each of the stories in TRC is fantastic, even if I didn’t specifically name the story and author. I’ll carry these stories with me for a long time. I really enjoyed The Robot Chronicles, just like I did with Synchronic and The Indie Side. David Gatewood is becoming someone to know in the science fiction short story game and his anthologies are now “can’t miss” books for me. The Robot Chronicles will be available for sale on Friday, July 25.